The structural design of shared information environments; the art and science of organizing and labelling websites, intranets, online communities and software to support usability and find-ability. Like most technical fields, Information Architecture tends to overcomplicate even the simplest of concepts. Connecting people to the content they’re looking for. Phew – much better. So, if IA is all about connecting people to the content they’re looking for, where can we see an example of it in our everyday lives? One example is that terrible remote control for that one crappy dvd player you have hiding in your house. You know the one I’m talking about: you won it at your company’s Christmas party, it doesn’t work unless you stand right in front of the player, and worst of all the buttons buttons on the physical interface itself make no sense. Like this one I have at my place: first, where is play button? Where is pause? Why is so much space given to the number buttons that I’ll never use? And why is the most prominent button the eject button? It has every function that you could ever need, but its impossible to find what you’re looking for. What this remote lacks is proper information architecture. As soon as you get your hands on it, it’s a lot more natural of a fit. Why is that? It’s using tools like grouping, color, hierarchy and shape to help convey the meaning and importance of these buttons. It’s still complex and can accomplish quite a lot, but it’s easier to use. This is what well-designed information architecture will bring to your interface. Once you start to think about it, you realize that information architecture is all around us. Even presentations like this one! So we ask ourselves, what do all of these things have in common? Information architecture helps us to navigate through complexity. It helps to make our interfaces intuitive and easy to understand. 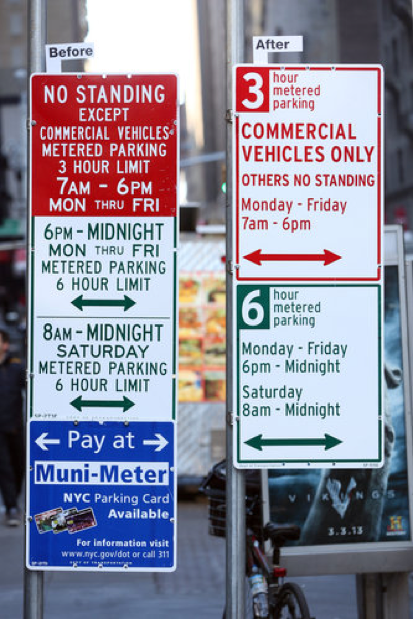 This image shows a recent redesign of NYC street signs. They use a lot of the concepts we’ll discuss next to clear up a ton of frustrations and confusion, leading to parking tickets and lots of frustrated people. A sincere thanks to my co-presenter Steven Fong for collaborating on this presentation and the content structure. I couldn’t have distilled down these concepts so nicely without Steven’s time and thoughts.